When life permits, I'll one day be able to really travel. I spent some time yesterday looking at travel photography and I know it's a challenge I want to face one day. But for now the timing is wrong, and I'm okay with that. I need to be here for my kids, both starting new journeys in school this fall, and for my hubby as he takes on extra work, and you'll see a new section soon to the blog for portraits.... something I need to work desperately for the next while. But when I DO have that hankering (sometimes daily, let's be real here!) to shoot interesting vistas, wonderful scenery, or curious subjects, I have everything right here. Where I live. If I time it right, if I look hard enough, if I'm patient and open to possibilities, I can fill that need and get images that still test my skills. 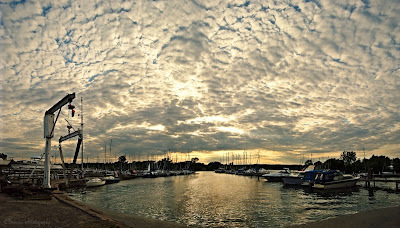 The panoramic shot above was taken at a local marina, one of my go-to places for landscape hankerings. To see it enlarged just click on the image above. I have never tried pano's before, and thought I'd give this scene a try. The last golden light of the day was quickly departing (hence the title) and I liked the cloud cover over the entrance to the boat launch, with equipment standing at attention, ready for the next day's boats to launch out of dry dock. I badly wanted all that sky contoured in the last light. And suddenly I heard the voice of a good friend and mentor, saying, "For heaven's sake CD, make a multiple image panoramic already".... so I did. He's been trying to get me to do this for the last year or so, so Bob - this is for you! This scene has four images stitched together and processed to tweak the light in the photo, allowing me to get from one end of the launch to the other within a single frame. And get all the sky over the whole scene. I was so excited to see this done, that it felt just like coming back from an adventure elsewhere. Now four shots combined isn't genius or anything, but I feel good for my first attempt. That's one for the bucket list! My point? I will never stop photographing where I live. It is training me now for the places and sights I'll photograph later... that's just too invaluable to ignore, or to sit around wishing I was somewhere else all the time. I hope the scenes I post through the blog inspire my readers to explore where they live, with or without a camera. Drop me a line and let me know where you live! My stats say that some of you are away across the pond, some away across the world... would love to actually hear from you! Thanks for the ramble... hope you're rambling about where you live too. I didn't even know you could put four pics together like that - cool! Love this pic, yet again:) I just put up 3 of your pics up in my new home, thank you again for the beautiful painting, baby pics of Josiah and then my contest winnings! You will more then likely go through my mind at least once a day! By the way, when you do eventually get to travel, you would get some amazing pics up here! It was actually less complicated than I thought, I can't wait to try this again. It's nice for one's work to be cherished in a family home, thanks Sarah for being so supportive. And yes, you can count on me to make a visit out at some point :) I'd love that! 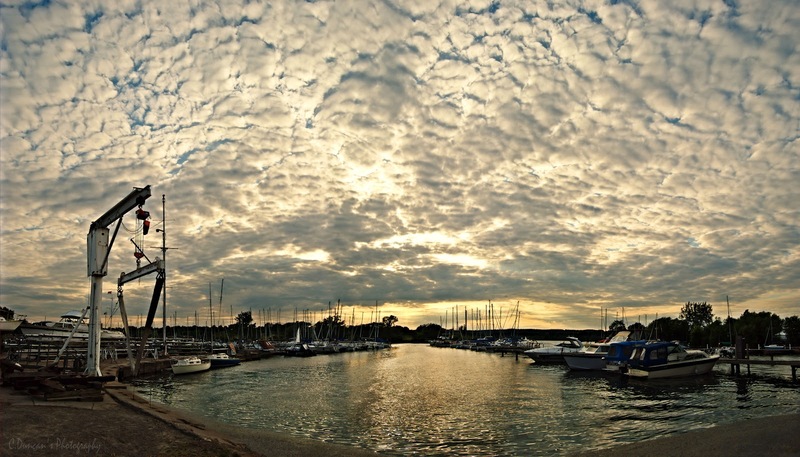 Panoramas can be good fun but the real beauty of this image for me is the sky. You've caught the detail so well and also held onto a nicely exposed marina (some adjustment in PhotoShop?) which makes for a really striking image. Does the marina have a clubhouse? If so, I'll bet they would like this on their wall!